This card was made using Art Impressions (AI) watercolor stamps with Tombow Dual Brush markers on Fabriano Studio cold press watercolor paper. 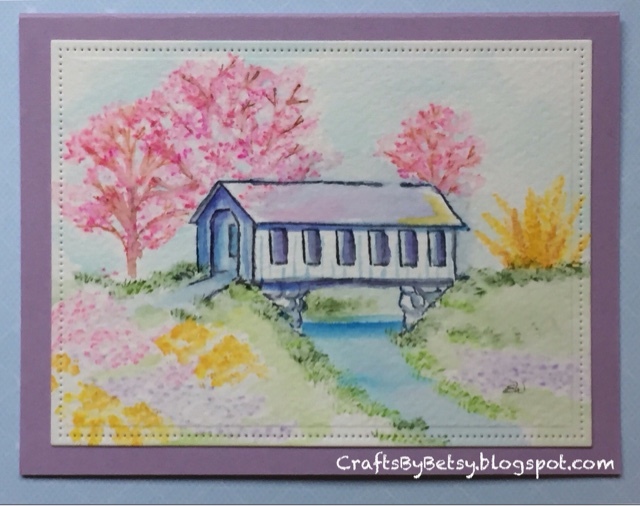 I used the AI covered bridge, flower, foliage and tree sets. I've got to admit that I did make a few attempts. AI is great to provide color, paper and even video suggestions/information for their stamps. But my waterbrush markers are Tombow and they didn't match well with my initial paper choices. Of my paper stash, they worked fabulously with the Fabriano paper. If you're having difficulty with any technique or medium choice, I suggest you try using different paper. It's amazing the different outcomes with just that slight change. And of course that additional practice can only help you in the long run! I also used the largest of Lawn Fawns small dotted rectangle stackable to cut out the piece before mounting to a periwinkle A2 card base. This is the final day for Art Impressions Spring-y challenge. Check it out! And in case you're wondering, YES so far I've managed to do a little color each day so far this month, my personal challenge for the 30 day coloring challenge! Oh my! This is so beautiful!!! Thanks so much for sharing your talents with us at Art Impressions!